My research interests lie at the intersection of book studies and the history of childhood. I focus on Japanese books from the Edo period (1603-1867), especially those written and published for children. These were produced between the seventeenth and nineteenth centuries using the same printing processes used to make ukiyo-e and other woodblock prints. I included books and prints from the Museum of Fine Arts, Boston (MFA), in my dissertation. After finishing the dissertation in 2012, I cataloged Japanese rare books at the MFA for about three years as a volunteer. The MFA has the largest and best collection of Japanese art outside Japan, and Japanese art makes up about a quarter of the museum’s entire holdings. There are over 100,000 Japanese objects in the collection. Of these, over 50,000 are prints–counting each sheet as one in the case of triptychs or albums. The core of the collection was acquired in the Meiji period (1868-1912), especially during the 1870s and 1880s. The museum has kept collecting Japanese objects, so there are modern and contemporary pieces as well as older items with historical, religious, or artistic significance. Because of the size of the Japanese collection and the fact that the colors in woodblock prints can be sensitive to light, only a small percentage of the collection is on view at any given time. In addition to the conservation issues with displaying prints, the MFA as a whole has so many departments and so much to show that the exhibition space for any given culture is limited. That was a little disappointing for me the first time I visited the museum, but between the website and the rotations in exhibits, it is possible to see quite a bit. Your best bet is to make use of the museum website (http://www.mfa.org) to virtually view museum objects and download images, especially if you already have specific items in mind. Private showings for research purposes are sometimes arranged for individual scholars, but much depends on the departments’ staff availability and schedules. Any requests of that kind should be made months in advance. There is a contact form that can be used for your initial request; select the particular collection from the drop-down menu. In your message, you may want to include information about your project, your affiliation, and when you will or could be in the Boston area. The website is an incredible resource, particularly in the area of Japanese woodblock prints. With the help of several grants between 2005 and 2010, the entire collection of Japanese prints was digitized. All of them. Some of the Japanese books have been digitized, and there are also about 20,000 Japanese postcards online. The print collection includes a wide variety of subjects, themes, and artists. I ended up using a few prints and two books from the MFA in my dissertation. I have never seen those particular prints in person, but I was able to locate them and download digital images online that were detailed enough for my purposes. The search interface has changed several times in the past few years, and the current version only allows basic keyword searches. You can enter keywords from the search bar on the museum’s main page or double-click on “Collections” in the menu bar. You can sometimes filter the search results by the collection, the classification, and whether the item is on view. For most of the prints, the artist and publisher are searchable, and the title and names of subjects are often searchable, especially with theatrical prints. In many cases, the signature is also given in Chinese or Japanese characters, but you will get better results if you search the Romanized names. It’s worth trying alternate names or keywords, since signatures vary. Because of the large collection, you should allow time to sift through the results and images, especially if you are looking for a common subject or a prolific artist. A test search on the keyword “Kunisada” gave me 8284 results. Switching the search to “Kunisada and Genji” (without quotes) still yielded 972 results. Wildcards are available (* or ?). Changing my search to “Kuni* and Genji” (without quotes) gave me 1297 items. Another option is to search via Ukiyo-e.org, which includes images from multiple websites and links back to the source sites. Ukiyo-e.org allows you to search by uploading an image to see if similar images are in the database. Once you find an image, you can save it directly from the MFA website. The image files are in jpg form, and the URLs are stable. Restrictions and fees apply to the use of images in publications. You can use MFA images in lectures and presentations without prior permission. To use an MFA image in a dissertation, book, or article (even online), you will need to contact Digital Image Resources (DIR) and provide the accession number and other information about both the artwork and the way that you plan to use it. Details and links to the forms for requesting images for reproduction are here: http://www.mfa.org/collections/mfa-images/license-images-reproduction. DIR suggests allowing two to three weeks to process the request. There is an extra charge of $250 for rush handling, so it’s best to plan ahead. In some cases, licensing fees may be waived for dissertations and similar academic uses if you ask in advance. Even in those cases, there are permissions to obtain and forms to sign. The cost of the digital image files themselves depends on whether you need them for your own studies or plan to reproduce them. High-resolution image files suitable for reprinting are currently $50 each if delivered by e-mail. Low-resolution files for personal study use are only $5, and the ones online can be saved for free. There is a separate form for requesting images for personal use: http://www.mfa.org/collections/mfa-images/study-and-personal-use/request-images-study-and-personal-use. If the object you want to show has not been digitized, you will need to pay for new photography, which can quickly become expensive. I was lucky enough to only need photography for one or two images. For that kind of special case, it would be best to consult DIR and leave extra time. The museum itself is located at 465 Huntington Avenue in Boston, Massachusetts. Parking is available but pricey, even if you get a discount on parking for becoming a museum member. Public transportation is available. The Green E line train has a Museum of Fine Arts Station across the street from the main entrance to the museum. There are also several bus lines that stop nearby. 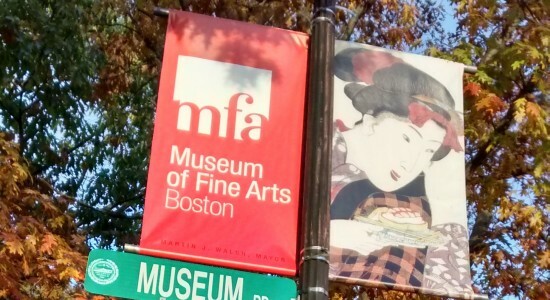 Details for hours and admission are here: http://www.mfa.org/visit. The museum is open from 10 a.m. to 4:45 p.m. from Saturday to Tuesday, and it has extended hours from 10 a.m. to 9:45 p.m. from Wednesday to Friday. Admission is $25 for adults and $23 for students. Students from some Boston-area universities have free admission, and admission is also free on Wednesdays after 4 p.m. and on occasional open house days. 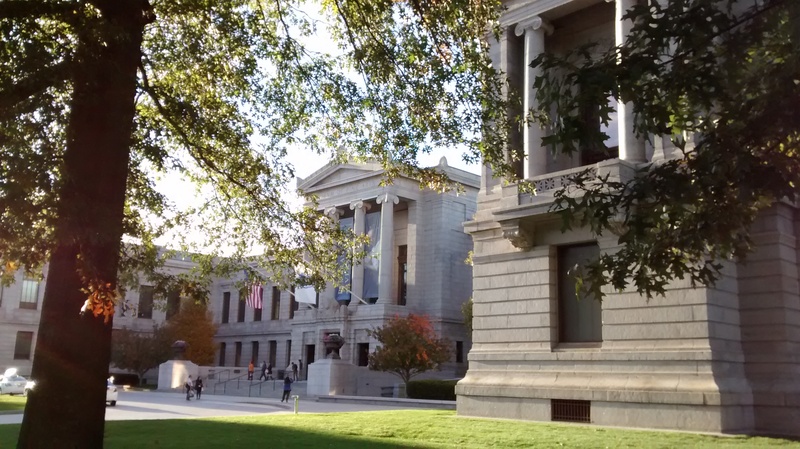 Image: Photographs of the MFA by the Author.